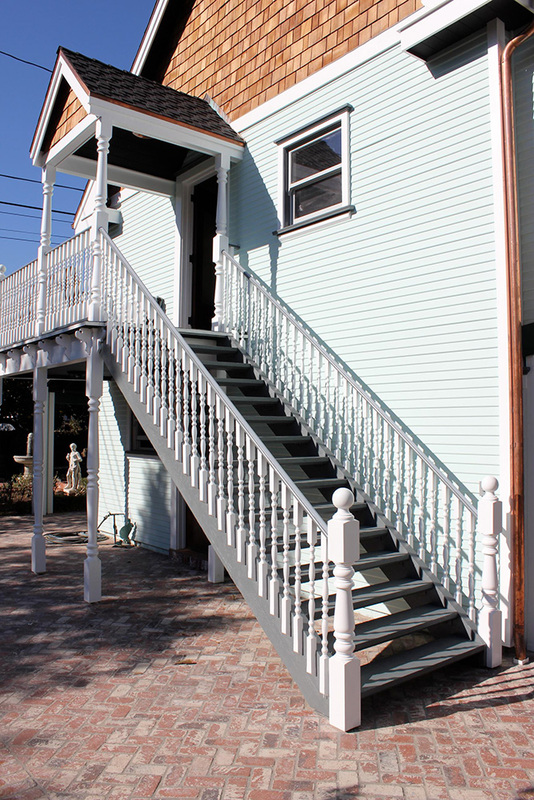 Many people have asked us if we can install their pool tables upstairs. Absolutely. Assuming your room is up to building code standards of course. Some of the homes that we’ve installed pool tables in upstairs have had floors that have flexed a bit. I’ve notice this as I’m leveling up a pool table for the first time. 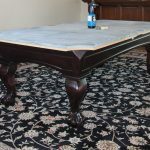 With all three pieces of slate on top of the cabinet, we’re talking about over 500 pounds of weight on a standard size pool table. When I would step close to one of the legs I’d notice the bubble in my Starrett Machinist’s level move a couple of lines out of level. Out of the hundreds of pool tables that I’ve installed upstairs no client has ever called us complaining that their table broke through the sub floor. I think that if certain floors bow a little more than others it might have something to do with how the floor joists are spaced out and/or how thick the sub floor is. Now getting a pool table upstairs however that’s another feat all it’s own. In the past 20 years of working on pool tables I can count on one hand the number of times we had to get real creative with getting a pool table in or out of a client’s house. 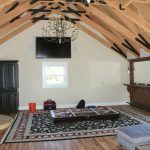 I’ve heard some stories from clients who have said that they had used a crane to get their pool table into their upstairs gameroom. Possibly because their staircase may not have been built with enough room to carry the cabinet upstairs. 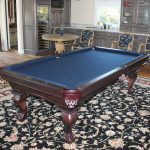 I remember one time in Huntington Beach we were on a pool table moving job on the third floor and my client wanted his pool table disassembled and the slates crated up for a long distance move. We could fit everything through the doorways and down two flights of stairs except for the darn cabinet. It was a pool table manufactured by Gandy out of Macon, GA, no matter what I tried the cabinet just would not come apart. Rack ‘Em Up People! 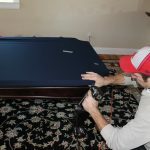 What brand of pool table is easiest to move up a flight of stairs that turns? Not a spiral staircase, just one with landings and 90 degree bends. Hello Tamen, it is not so much the brand of pool table as much as it is the slate configuration. If you plan on having a pool table in an upstairs room I would highly recommend owning a three piece slate design. Your back and the backs of your closest friends will thank you! It is no fun moving a “widow maker”, that’s what I call an eight foot pool table with a one piece slate. Best, David.